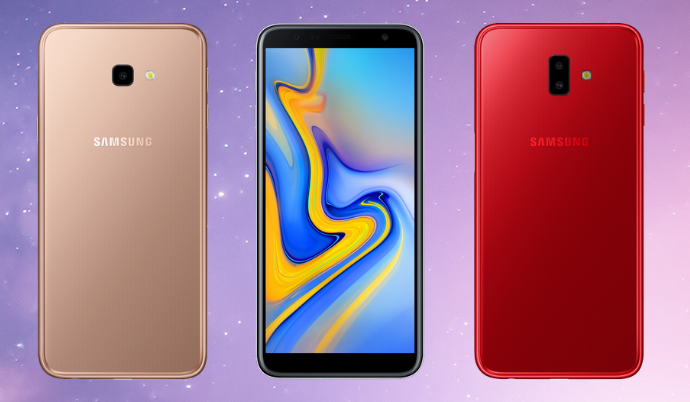 We have been witnessing many leaks of the Samsung Galaxy J4+ and Galaxy J6+ from past few days and the South Korean giant has unveiled these handsets officially but it hasn’t revealed the availability and pricing yet. According to the specs sheet, the smartphones will be coming with similar hardware that we have been experiencing in the J-series line of devices along with few new additions. Well, both the handset look similar to each other from the front while the Galaxy J4+ will be sporting just one camera on the rear, unlike all the new devices. On the other hand, the Galaxy J6+ will be featuring a dual rear camera setup and will also come with a fingerprint sensor that not only unlocks the device but also acts as a power button. The J6+ will be made available in Red, Black and Grey color options while the Galaxy J4+ will come in Gold, Black and Pink color options. Keeping aside the storage on the cameras, both the device has same specifications as they are equipped with a Qualcomm Snapdragon 425 quad-core processor along with 6.0-inch Infinity display with HD+ (1480 x 720 pixels) resolution. On the other hand, the Galaxy J4+ will come with 2GB/3GB of RAM along with 16GB or 32GB of storage options. The Galaxy J6+ will sport 3GB/4GB RAM options along with 32GB and 64 GB of onboard memory. The cameras on these handsets vary as mentioned above, as the J4+ comes with a 13MP rear camera with f/1.9 aperture and a 5MP front camera with f/2.2 aperture size while the Galaxy J6+ has a 13MP + 5MP camera setup with f/1.9 aperture size along with 8MP selfie camera. Both the handset will have 3000mAh battery without the fast charge support and will be coming out of the box with the latest Android 8.1 Oreo operating system along with Samsungs Experience UI on top. What are your views on these handsets? Comment in the section below and stay tuned to Android Advices for more news and updates.